With pompoms in hand and smiles across their faces, dozens of students from Kimball, Tracy and West High School lined the red carpet and cheered as families filed in the room. 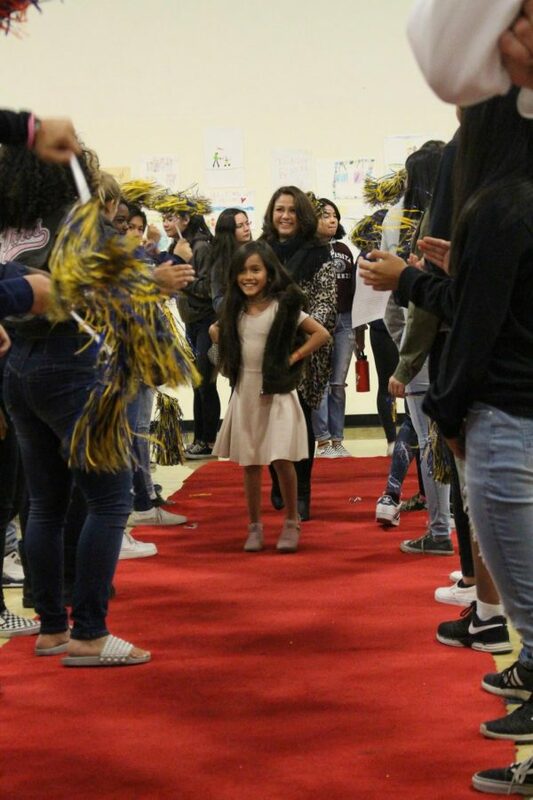 The Tracy Unified School District Anti-Bullying Committee held the 8th annual Red Carpet Award Ceremony on Wednesday, November 14 in Kimball High School’s Sports Complex to celebrate Anti-Bullying month. Students of the elementary, middle and high schools of Tracy Unified School District (TUSD) were asked to interpret the theme of the night, “Kindness counts, it starts with me!” and express it in the form of a poster. Many participated, but only a select group from each school became finalists to be awarded. The finalists also had the honor of having their vibrant, inspiring art displayed along the walls of the entryway to be admired by all. Hundreds of Tracy residents including Tracy Mayor Robert Rickman, West High alumnus and now city councilman Dan Arriola and West High principal Dr. Zachary Boswell came out to celebrate Anti-Bullying month as well as the student’s successes.